Current criteria for performing relaparotomy for suspected peritonitis are non explicit and based on non-quantitative, subjective arguments or hospital practice. The aim of this study was to determine the value of routinely used clinical and diagnostic parameters in early detection of postoperative, diffuse peritonitis (PP). Furthermore, the prognosis and outcome after early indication for relaparotomy in patients with PP compared to community-aquired peritonitis (CAP) was evaluated. Between 1999 and 2008, a total of 251 patients with diffuse secondary peritonitis either postoperative (PP) or community acquired (CAP) were analyzed retrospectively. PP (n = 114) and CAP (n = 137) were compared regarding physical examination, MPI-Score, APACHE II-Score, evidence of organ failure, laboratory parameters, diagnostic instruments and clinical course. The treatment regimen comprised surgical source control (with/without programmed lavage), abdominal closure and relaparotomy on demand, broad spectrum antibiotic therapy and intensive care support. The APACHE II-Score (20 CAP vs. 22 PP, p = 0.012), MPI-Score (27 CAP vs. 30 PP, p = 0.001) and the number of lavages differed significantly. Positive phyiscal testing and signs of sepsis [abdominal pain (81.6% PP vs. CAP 97.1%, p = 0.03), rebound tenderness (21.9% vs. 35.8%, p = 0.02), fever (35.1% vs. 51.8%, p = 0.03)] occurred significantly less often in the PP patients than in the CAP group. Conventional radiography (66.2%) and ultrasonography (44.3%) had a lower diagnostic sensitivity than did abdominal CT-scan (97.2%). Mortality was higher in the PP group but did not differ significantly between the two groups (47.4% PP vs. 35.8% CAP, p = 0.06). The value of physical tests and laboratory parameters in diagnosing abdominal sepsis is limited. CT-scanning revealed the highest diagnostic accuracy. A treatment regimen of early relaprotomy appears to be the most reasonable strategy for as early discovery of postoperative peritonitis as possible. Secondary peritonitis accounts for approximately 90% of all peritonitis cases in western countries . Within this group diffuse postoperative peritonitis (PP) and abdominal sepsis are common concerns following surgical interventions. The current literature indicates a rate of between 30 and 42% for diffuse postoperative peritonitis within the subgroup of secondary peritonitis [2–4]. Despite the development of antibiotics and significant improvement in intensive care support, morbidity is high and mortality rates remain between 30-66% [5–10]. The surgical treatment of PP is primarily aimed at defining source control, followed by debridement of fibrin bedding and abdominal lavage of contaminants and infectious fluids. Nevertheless, the prognosis and outcome of patients with PP is directly related to early diagnosis and stringent treatment interventions. Recently, encouraging data have been published favoring a relaparotomy-on-demand strategy . Current criteria for performing relaparotomy are non-explicit and are based on non-quantitative, subjective arguments or hospital doctrines. Furthermore, it is known that failure of initial antibiotic therapy in patients with complicated intraabdominal infections is associated with higher mortality rates . Multiple scoring systems predicting the development of severe, life-threatening abdominal sepsis have been established but frequently fail to prognosticate the early onset of peritonitis and therefore miss the ideal time point for intervention. Reliable clinical parameters as well as precise diagnostic predictors which allow for precise detection of PP would thus be of paramount importance. The aim of this retrospective study was to clarify the value of routinely used clinical and diagnostic parameters in early detection of PP compared to community acquired peritonitis (CAP). Furthermore, the prognosis and outcome after early indication for relaparotomy in patients with PP was evaluated. A total of 251 patients with diffuse secondary peritonitis treated between May 1999 and April 2008 at the Department of Surgery, University of Schleswig-Holstein Campus Lübeck, were evaluated retrospectively. All consecutive cases within this time-frame were included. This group of patients comprised 114 individuals with PP and 137 patients with CAP, the latter serving as a control group. All data regarding short and long term medical history, physical examination, MPI-score, APACHE II-score, laboratory values, imaging procedures (ultrasound, CT-scan, contrast-media imaging, mesenteric angiography), intraoperative findings, operative procedures and postoperative course were collected in our 'peritonitis-database' annually. Diffuse secondary peritonitis was defined as intraoperative evidence of inflammation of the peritoneal surface and/or contaminants/infectious peritoneal fluid in all quadrants due to an intestinal perforation. CAP and PP were defined accordingly. In addition, PP was defined as a direct (e.g. anastomotic leakage) or indirect (e.g. perforated gastric ulcer after hemicolectomy) complication of a previously performed abdominal surgery. All cases of localized peritonitis were excluded. Furthermore, patients with suspected peritonitis but negative findings at the time of laparotomy were not included in the peritonitis database. Diagnostic procedures in the case of suspected secondary diffuse peritonitis included abdominal ultrasound, CT-scan and radiological imaging using contrast-media as well as mesenteric angiography (when appropriate). Indication for relaparotomy after positive findings in CT-scan were based on the following citeria: Evidence of leakage, intraabdomnal air after more than five days postoperatively, and/or massive collection of intraabdominal fluid. The diagnostic significance was defined as 'correct' when correlating with intraoperative findings. The APACHE II-score, the values for C-reactive protein (CRP), white blood cells (WBC), lactate and antithrombine III (AT III) were all documented daily for the first 7 days and twice a week thereafter until the patients were discharged. The surgical treatment was primarily aimed at definitive source control, followed by gentle debridement of fibrin bedding and abdominal lavage with lactated Ringer's-solution and Polyhexanide. Relaparotomy was performed immediately following positive radiological examination and/or indicative clinical/laboratory signs. In PP, negative radiological findings and persistent symptoms of sepsis for longer than 24 hours were also indications for relaparotomy. After the intraoperative diagnosis of secondary peritonitis, relaparotomy was performed every 24-48 hours on a scheduled basis (at least once), until intraoperative findings allowed for an abdominal closure. In case of dehiscent abdominal fascia, a Dexon®mesh was used. To determine differences between the two groups (PP versus CAP), the χ2-test and Mann-Whitney U-test were used when appropriate. P < 0.05 was considered as being statistically significant. Statistical analyses were performed using Statistical Package for Social Science (SPSS®, version 12.0) for Windows (SPSS®, Chicago, Illinois, USA). Of 251 patients treated for diffuse secondary peritonitis 114 (45.4%) were defined as PP and 137 (54.6%) as CAP. The median daily evaluated APACHE II-score for all patients was 21.0. Within the PP group the APACHE II-score was significantly higher (median 22.0) compared to in the CAP group (median 20.0) (p = 0.012). The mortality rate was also higher within the PP group, but was not significantly different compared to that of the CAP patients (p = 0.06). The characteristics for both study groups are presented in Table 1. The underlying cause for secondary diffuse peritonitis regarding the anatomic origin is depicted in Figure 1a. a Anatomical origin of secondary peritonitis. No statistically significant differences between PP and CAP (p > 0.05). b. Anatomical origin of secondary peritonitis and mortality. Statistical analyses revealed no significant differences regarding mortality and anatomic origin of sec ondary peritonitis between the two groups except for the appendix [4/17(CAP) vs. 0/3(PP), p = 0.01] and the hepatobiliary tract [2/7(CAP) vs. 8/10(PP), p = 0.03] (Figure 1b). A total of 93 patients (81.6%) within the PP group and 133 patients (97.1%) in the CAP group presented with abdominal pain at the time of physical examination (p = 0.03). 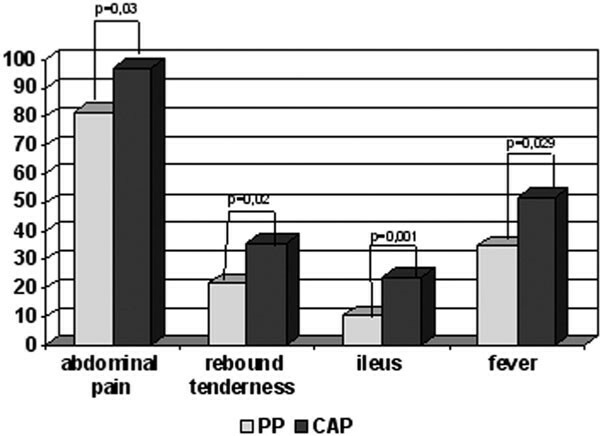 Abdominal rebound tenderness occurred in 25 (PP, 21.9%) and 49 (CAP, 35.8%) patients, respectively (p = 0.02). Furthermore, 40 patients (35.1%) within the PP group and 71 patients (51.8%) within the CAP group, respectively, presented with fever exceeding 38.5°C (p = 0.029) (Figure 2). Graphs depict the differences of clinical parameters. Clinical signs differ significantly between the two groups and are therefore of limited diagnotic value. Over 95% of all patients presented with elevated infection parameters (WBC, CRP) but with no statistically significant difference between the two groups. Similarly, lactate and AT III values revealed no significant differences between the CAP and PP groups, respectively. Differences in clinical and paraclinical parameters for both groups are given in Table 2. PP was predicted correctly using diagnostic imaging in 97.2% (CT-scan), 66.2% (Radiographs with contrast-medium) and 44.3% (Sonography), respectively (Table 3). Only CT-scan showed high sensitivity in diagnosing PP. The causes for peritonitis in the PP group were as follows: Anastomotic leakage 50.9% (n = 58), perforations 22.8% (n = 26), mesenteric ischemia 11.4% (n = 13) and others 14.9% (n = 17). The number of abdominal lavages was significantly higher in the PP group (4.5 median) compared to the CAP group (2.5 median) (p = 0.009). In the CAP group one or two lavages were significantly more frequent than within the PP group (62.0% vs. 40.7%; p = 0.001). More than four lavages were performed more frequently in the PP group (27.4% vs. 10.2%; p < 0.001). Early detection and diagnosis in secondary peritonitis, either postoperative or community-acquired, is critical for defining the most effective treatment intervention. Clinical monitoring should be aimed at early identification of the source of the complication before secondary organ failure aggravates the clinical situation. The complication itself does not frequently represent the major problem, but is more likely a consequence of late diagnosis and therefore of insufficient therapy. Thus the identification of early predictive indicators of peritonitis and abdominal sepsis is of utmost importance [10, 11, 13–16]. In our study we demonstrate that routinely used clinical and paraclinical parameters are of limited predictive value in the diagnosis of PP when compared to the group of patients with CAP. Slightly more than 50% of patients within the PP group presented with abdominal pain or tenderness to palpation accompanied by fever at the time of physical examination. Furthermore, clinical signs of peritonitis such as rigidity or rebound tenderness were only evident in 21.9% of these patients. This could be explained by the predominant post-aggression catabolism as well as by the postoperative administration of analgetic drugs . These patients are therefore frequently diagnosed after signs of sepsis have already occurred [5, 7, 10, 15, 17–19]. The low accuracy of physical tests in diagnosing postoperative peritonitis reflects the questionable value of a so-called 'experienced surgeon'. Of course, clinical judgment remains important but seems to frequently fail in times of effective postoperative analgesia and sedation of intubated patients [15, 19]. This is underlined by the fact that physical tests are not included in the 'top-ten ranked' variables for inpatient mortality of relaparotomy outcome in peritonitis patients . The current situation is thus that physical tests do not yield meaningful variables with respect to prediction of ongoing abdominal sepsis. Analysis of laboratory infection parameters such as leukocytosis and C-reactive protein revealed no significant difference between the two groups. Furthermore, levels of AT III and lactate as parameters for mesenteric ischemia and coagulopathy within the course of sepsis were also not significantly different. Other diagnostic parameters such as interleukin 6 and tumor necrosis factor α (TNFα) levels are implicated as being important in the early onset of sepsis but do not correlate with outcome [20–22]. Moreover, their short half-lives make their diagnostic applicability questionable . There has been great interest in the diagnostic and prognostic potential of procalcitonin in abdominal sepsis. Even though existing data support the sensitivity and specificity as an early marker for sepsis, its value is discussed controversial [8, 24, 25]. Recently, determination of procalcitonin levels in peritonitis was associated with a low sensitivity and specificity . In severe abdominal inflammation such as peritonitis, other sources such as catheter infections, pulmonary or urinary tract infections have to be taken into account in critically ill patients. Once secondary peritonitis is suspected clinically, further investigations such as abdominal ultrasound and radiograph-based imaging techniques are necessary to confirm the presence and source of peritonitis. In our study the use of abdominal ultrasonography only revealed a sensitivity of 46%, possibly due to commonly occurring paralysis and/or meteorism of the intestines. Undoubtedly, mesentericography and radiograph imaging using contrast dyes have their value. Within this study, CT-scan revealed a sensitivity of 97.2% in detecting formation and source of peritonitis and was therefore the most precise and valuable imaging technique. Other studies support the utilization of CT-scanning in the diagnosis of secondary PP [27, 28]. An optimal scoring system should fulfill the following criteria: Objective, readily measurable under routine conditions, simple, easy available but also reliable, specific for the function of the organ considered and independent on the type of patient and therapeutic intervention. With the exception of the abdominal CT-scan, the investigated clinical and laboratory parameters unfortunately did not meet these criteria . Due to the retrospective character of the study only sensitivity and not specificity can be presented. The lack of statistical difference in mortality rates between the two groups are probably caused by the most early intervention, even in doubtful cases. The significantly higher number of lavages necessary in the PP group indicates that these patients are either diagnosed too late (despite most early indication for relaparotomy) or are more susceptible to bacteraemia due to predominant immunosuppression. Nevertheless, the re-laparotomy strategy was not an outcome measure in this study. Thus, no clear recommendations can be given from our data. There is no ideal control group for patients with diffuse PP to assess the value of diagnostic parameters. A comparison with uncomplicated recovering patients having undergone elective abdominal surgery would give apparently clear results but would not reflect the group of importance - postoperative patients in the ICU in critical condition with the question of whether to perform relaparotomy or not. We therefore consider the group of patients with diffuse CAP to be the most appropriate due to the comparable extent of peritonitis and the severity of sepsis signs. The separation between diffuse CAP and PP is undoubtfully artificial. It might be more appropriate to compare patients with surgically proven peritonitis and patients suspicious for peritonitis but without surgical findings at the time of laparotomy. Due to the retrospective character of this study it is almost impossible to re-evaluate the latter group. Evaluating on the other hand - this more "ideal" study collective in a randomized controlled setting might increase the clinical awareness and therefore leading to an evaluation bias. Nevertheless, earlier diagnosis and consecutive treatment in these patients is frequently performed because of the more frequently apparent clinical symptoms. This has to be taken into account critically for the assessment of the results revealed by this study. Despite advances in intensive care support, scoring systems and sophisticated markers, early diagnosis of generalized PP remains difficult. In our study, clinical and laboratory parameters were of limited value in the early diagnosis of PP. The most reliable imaging technique was the CT-scan. Only interventions prior to sepsis onset and development of MOF can reduce morbidity and mortality. We thus favour early relaparotomy even in suspected cases of PP as being the appropriate timepoint for intervention. Prof. Robert Harris, Karolinska Institutet, Stockholm is greatefully acknowledged for critical reviewing the manuscript and his helpful comments.